On 24 November 2014 Dr. Akkan Suver, Vice-President of BSCSIF represented the Black Sea – Caspian Sea International Fund at the 11th Vienna Economic Forum – Vienna Summit 2014 that was held in Niederösterreich, Vienna. The President of Austria Dr. Heinz Fischer, Federal Chancellor of Austria, Werner Fayman, Prime Minister of Montenegro Milo Djukanovic, Prime Minister of Albania Edi Rama, Prime Minister of Macedonia Nikola Gruevski, were among the distinguished participants of the Forum. 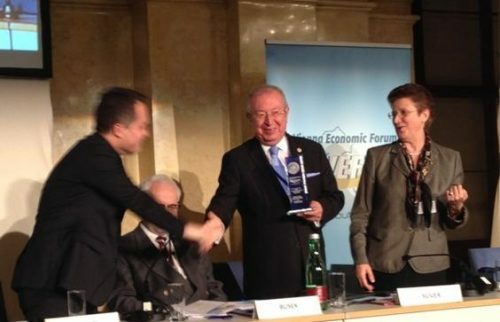 The president of Vienna Economic Forum Dr. Erhard Busek and Secretary General Elena Kirtcheva presented the award “Strategic Partner of the Year” to the BSCSIF Vice-president Dr. Suver. During the Summit Dr. Akkan Suver made a speech outlining the importance of Vienna Economic Forum’s activity and of strategic cooperation between the two international organizations – BSCSIF and Vienna Economic Forum that would culminate in the memorandum of understanding that is planned to be signed by the Presidents of the two organizations next year.Dr. Suver, has been also hosted byTurkey’s Ambassador in Vienna Mehmet Hasan Gogus, as well has met with Member of the Parliament -who has Turkish origins- Mr. Efgani Dönmez and one of the leaders of the Turkish community Birol Kılıç.